"Dr" Andreas Ludwig Kalcker is a ruggedly-handsome polyglot with a cool set of wheels -- but there are far more important reasons to dislike him. He promotes the intake of so-called MMS chlorine-dioxide cure-all, (an industrial bleach), to be administered orally and/or rectally, as a treatment for a wide range of serious and life-threatening medical conditions, including autism, cancer, malaria and HIV/AIDS. "Dr" Kalcker simultaneously puts forward the competing views that autism is caused by mercury in vaccines, and that autism is caused by intestinal parasites, (the latter to be treated with MMS enemas). Not a medical doctor, Kalcker also illustrates the use of corrosive "black salve" on his website as a way to treat skin disease, a strategy which is known to be an effective way to remove minor nasal skin conditions cut off your nose to spite your face get rid of your nose. He also promotes the HHO water-powered engine concept with his big silver recreational-vehicle that allegedly obtains most (but importantly not all) of its power from water. The monster-vehicle is used to simultaneously promote water-powered engines and the chlorine-dioxide panacea. Given his interest in subjects as diverse as industrial-chemicals which allegedly cure many human ills, and engines which allegedly run on water, "Dr" Andreas Ludwig Kalcker is either a scam-artist with an unusually broad repertoire, or a prime example of crank magnetism. A group photo of "Dr" Andreas Ludwig Kalcker, Kerri Rivera and "Archbishop" Jim Humble: the father of the MMS "protocol"
"Dr" Kalcker's woefully-underdeveloped conspiracy-theory about the UFO phenomenon is only available in Spanish , but Google can translate(ish). 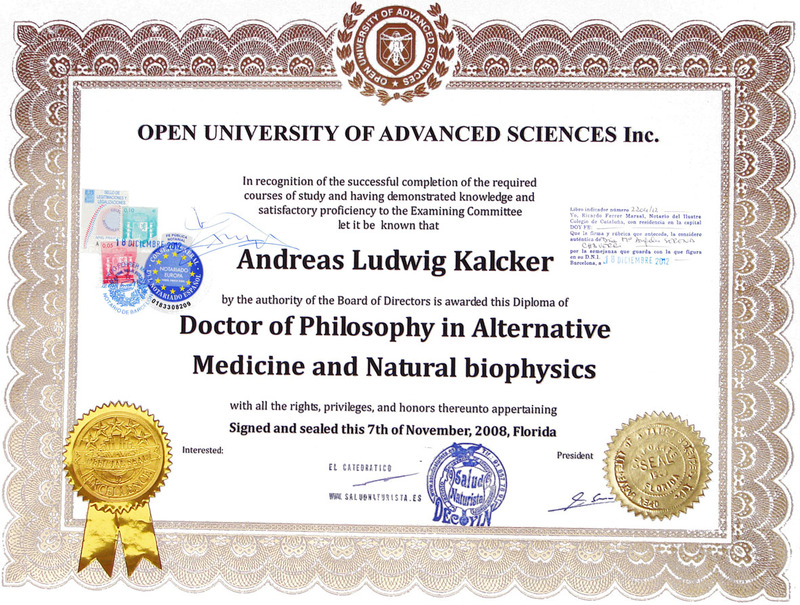 ↑ On "Dr" Kalcker's website he exaggerated the mercury dose in vaccine by 1000x by repeatedly stating "mg Hg" when it should be "µg Hg"
↑ Allegedly his Ph.D. is "Doctor of Philosophy in Alternative Medicine and Natural biophysics", but it is from a diploma-mill called "Open University of Advanced Sciences Inc."
↑ Photos of "Dr" Kalcker being presented with his dodgy diploma, (note the"Reiki" certificate next to his left ear). 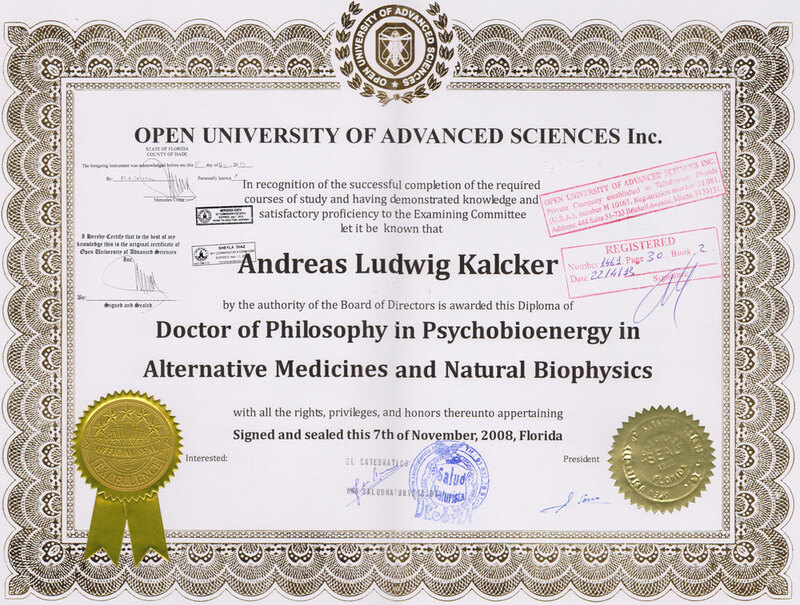 ↑ A link to another Ph.D. diploma from "Dr" Kalcker, but this one includes the additional term "Psychobioenergy", (it is also from the OUAS Inc. diploma-mill)." ↑ A link to a photo of Kalcker's silver dream machine, (image includes some photoshoppery, but is largely real). This page was last modified on 24 December 2018, at 06:58.